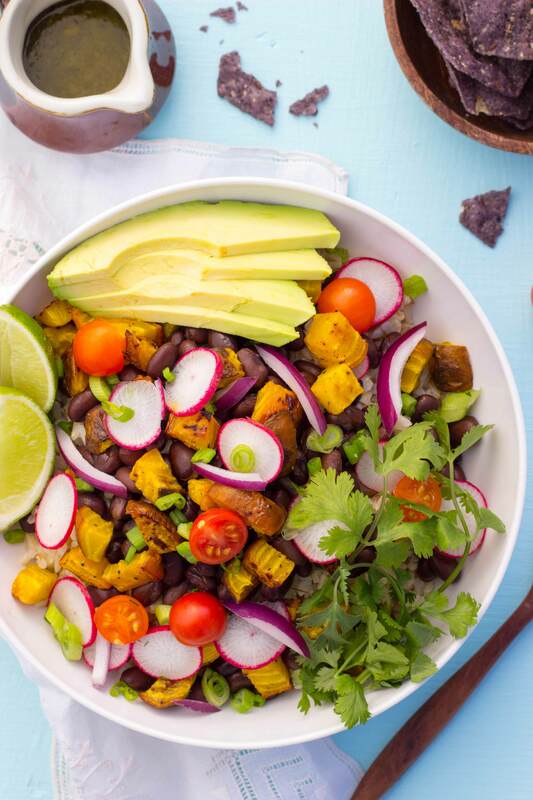 These colorful burrito bowls combine fresh spring vegetables with hearty rice and black beans for a healthy, filling meal. Crumbled corn chips add crunch, while a bright cilantro-lime dressing ties the whole bowl together. Pre-heat the oven to 400° F. Place chopped beets onto a large cookie sheet and add olive oil, salt and pepper. Toss to coat and bake until beets are fork tender, about 30 minutes. Put the dressing ingredients into a blender and blend until emulsified, about 30 seconds. Assemble the burrito bowls: Equally divide all ingredients into four bowls. In each bowl you will add about ¾ cups rice, ²⁄3 cup beets, ½ cup black beans, 1 sliced radish, ¼ avocado, 1 small handful sliced red onion, ¼ cup chopped tomatoes, 1 tablespoon green onion and ¼ cup crumbled chips. Add desired amount of dressing to each bowl and mix together. Serve warm. Nutrition Analysis: 830 cal, 46 g fat, 0 mg chol, 560 mg sodium, 92 g carbs, 19 g fiber, 14 g sugar, 17 g protein. Recipe and photos by Isadora Lassance. Lassance lives in Tucson, Arizona, with her husband and their orange cat, Cheeto. She blogs about whole food and seasonal ingredients at shelikesfood.com.